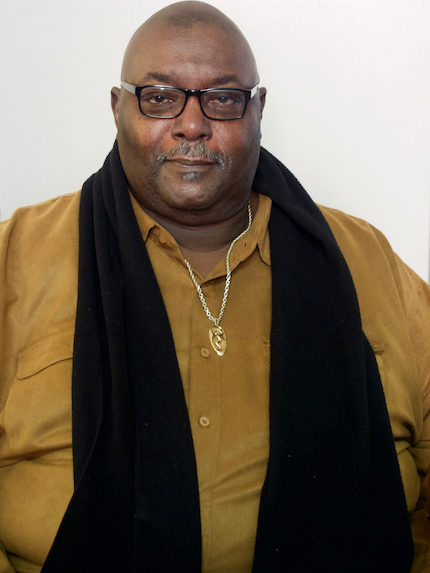 Over two dozen local African American oral histories collected by Nyack Record Shop Project volunteers in January 2018 form the basis of two upcoming events. On Saturday, September 8 at 1pm, an exhibit of images and audio will open at the museum of the Historical Society of the Nyacks. 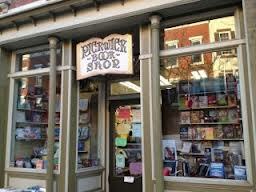 On Tuesday, September 11 at 7p, I am moderating a panel of Nyack Record Shop Project storytellers at the Nyack Library. 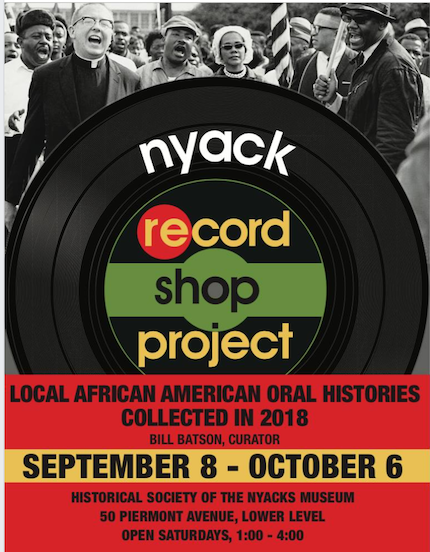 Invest sometime at either Record Shop Project event and sample a collection of local history that represents 1,540 years of “living while black” in Nyack. 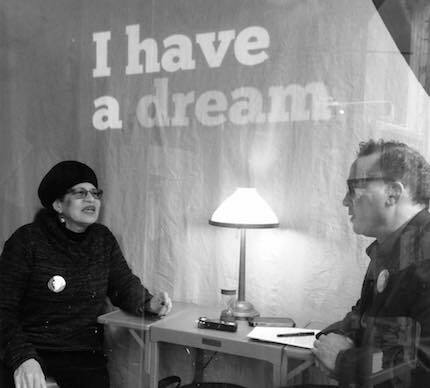 The Nyack Record Shop Project collected oral histories from the African American community for a week at Grace Episcopal Church, Main Street Beat and Meals on Wheels Nyack. The effort was launched on Rev. Dr. Martin Luther King’s Birthday – January 15, 2018 at the interfaith service commemorating Dr. King and his life’s work hosted by Dr. Frances E. Pratt, President of the Nyack branch of the NAACP. The collaboration was inspired by the Beacon Project an exhibit of photographs by Carrie May Weems taken in a Hudson Valley village similar to Nyack. Oral histories that she collected in a record shop informed the series. The project was the result of a collaboration of arts, civic, religious and local history organizations led by the Edward Hopper House Museum and Study Center and the Historical Society of the Nyack. I was invited to serve as Director. The positive impact of the Nyack Record Shop project is underscored by the numbers: before this initiative, the Nyack Library had approximately 65 oral histories on file, and of those, only eight were of African Americans. Now there are 92 oral histories in total with 36 from the African American community. According to the 2010 census, Nyack is 23% African American. Thus, as a result of the Nyack Record Shop Project, 30% of the archived oral histories on record are from the African American community, a rare example of social equity skewing in favor of a marginalized group. When Rev. Dr. Martin Luther King Jr. was killed 50 years ago in April of 2018, the assassin was not just trying to silence a man, but a people. A people who believe in freedom, and who will not rest until it’s achieved. A people who are proud of their ancestry, despite being called inferior and indolent by the dominant culture in America and Europe. A community that in Nyack has not allowed the infamous act of a murderer with a fire arm to silence the voice of the generation who endured and overthrew the tradition of Jim Crow racial discrimination in America. We will not be the complicit in our one eradication– if we fail to record the life story of our elders before they depart, we are finishing the job King’s assassins started. Would you ever throw out your cell phone without downloading all the memory: phone numbers and photos, password and personal information? That’s what we do when we let our elders go to sleep without down loading their memories. Come plug into this stream of first-hand lived experience and learn about the value and vitality of local oral history. The oral histories collected by the Nyack Record Shop Project can also be heard at the soundcloud. This exhibit will share images of the 28 men and women who gave interviews in January, 2018 excerpts from the transcripts, and other documents and artifacts during the Nyack Record Shop Project. There will be a listen station where visitors can enjoy the interviews. There will be an opening reception on Saturday, September 8 at 1p at the Historical Society Museum located in the bottom of the Depew House at 50 Piermont Avenue, directly behind the Nyack Library. The museum is open from 1p – 4p on Saturdays. The Nyack Record Shop Project exhibit is on display until October 6. 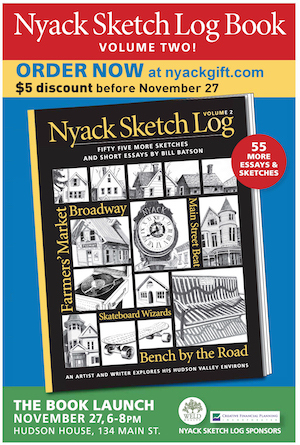 The first John Scott Armchair Tours Illustrated Slide Presentations on Sept. 11 & 14 will feature the Nyack Record Shop Project. Participants Jamal Bey, Eunice Turnbull and John P. Vasser, Sr. will join me for a panel discussion to answer questions about their oral histories and to discuss their experience with the process. Thursday Dec. 6 and Friday, December 7 Win Perry presents: What’s Happening at the John Green House?